I got on my bike after 9:30pm on a school night–whoa–and headed down to the venue to meet S. for a show. It was a little bit cool when I left, but a block and a half on the bike and I was plenty warm as I flew down St. Charles. Turns out when you aren’t packing any gear, the bike feels lighter. It felt so good to be on the bike, and I got where I was going much too quickly. I waited in line, but to no avail–the show was sold out–but my show must always go on. I got back on the bike and pedaled around the French Quarter, passing drunk businessmen stumbling along Bourbon Street, a couple of Bachelorette parties in full effect, and all other sundry tourists and workers. I headed back Uptown on Royal and stopped to take a picture through the window at James H. Cohen and Sons, a shop selling old weapons, coins, and currency. 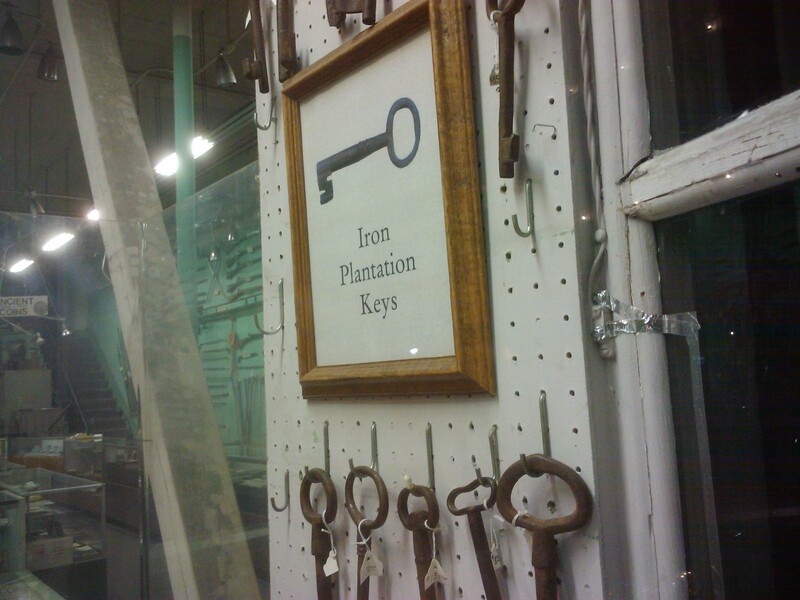 They’re also selling old plantation keys, $135 a pop. They’re also selling “baby bonds,” $5 bonds sold to rescue Louisiana’s economy, “destroyed by the Carpet Bagger Government,” according to the sign. This place is selling a certain kind of history, one I’m certainly not buying. This entry was posted in history, military and tagged Edward Sharpe & the Magnetic Zeros, French Quarter, Howlin' Wolf, James H. Cohen & Sons, New Orleans, plantation keys. Bookmark the permalink. Wonder how business is for these folks.